If you’re an atheist and not on Twitter, where have you been!? The atheosphere is alive and well there, thriving in a see of @Tweets, RTs, and #tags (like #atheist, #atheism) which are handy ways to sort the “tweets” -short, 140 character micro-blog posts that announce what’s up to your followers and whoever picks up your tag. As a social tool, Twitter is effective at getting the word out. The recent Iranian protests demonstrated this, so its natural, perhaps, that atheists who consider themselves activists in the cause of consciousness-raising have found themselves on Twitter and being followed. Closely. One of my favorite bloggers, vjack of Atheist Revolution has over 1150 followers. Hemant Mehta of The Friendly Atheist has over 1900 and PZ Myers of Pharyngula has over 8450! Incidentally, Hemant is following PZ, who’s following Richard Dawkins, who has over 13,516 followers! Vjack and I are following all three. Twitter is tool a for understanding peopleâ€™s experiences with atheism in different countries and a convenient medium for exchanging brief, efficient messages, especially for atheists who donâ€™t have the time or energy to commit to a full-blown blog. If you want some truly interesting people to follow, check out Richard Dawkins’ follows. For as many followers as he garnered, Dawkins is only following a handful -21 to be precise. To round out the Four Horsemen, Dennett’s following/follower ratio is 0/0; Sam Harris is 0/0; and Christopher Hitchens is 0/6860. Hitch has a single tweet! Among Dawkin’s 21 “following”, however, is Phil Plait, Adam Savage, PZ Myers, Rebecca Watson, and “David” who’s Twitter page is “Beeritforward” and who claims to tweet each time he takes a drink! 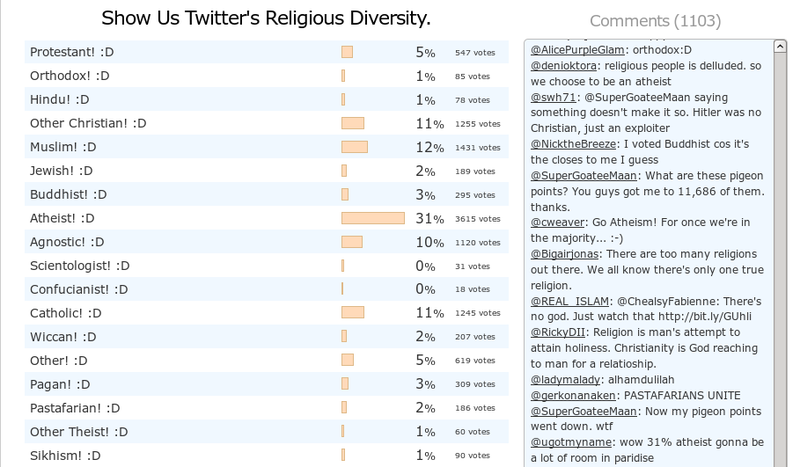 I recommend the RNS article, Atheists put their faith in Twitter. Its a good read. This entry was posted in Atheosphere, blogging and tagged Adam Savage, atheism, christopher hitchens, Phil Plait, PZ Myers, Richard Dawkins, sam harris, twitter. Bookmark the permalink. Twitter is definitely an amazing tool for bringing the atheist community together. Ironically, I wrote a post on the Power of Twitter and Atheism not too long ago that describes how quickly atheists can find each other just using Twitter. You can find that post here (if interested) – http://blog.christophercain.ca/2009/09/11/the-power-of-twitter/. That was a great post, thanks for linking it here. I like the way you walk through the sign-up process, which shows those who haven’t used Twitter before just how easy it is.